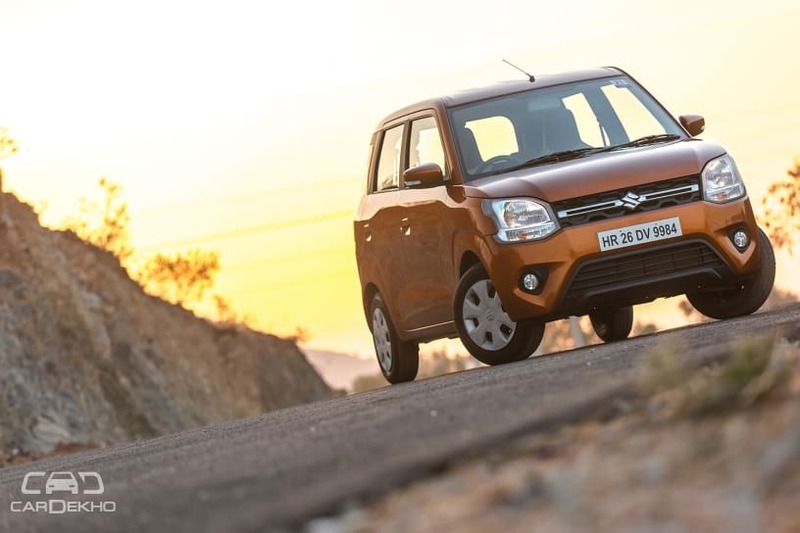 The Maruti WagonR has been among the top choices for buyers looking for a practical and utilitarian hatchback for over two decades. The tallboy boxy design of the previous generation WagonR was a functional choice aimed at making it more practical than any other hatchback on sale. But as market trends, customer preferences, as well as safety and emission norms evolve, so has the WagonR. Naturally, we had to take the recently launched third-gen WagonR out for a short spin to find out whether it has only built upon its core values of practicality or if it has become a tougher all-rounder to take on its fierce rivals. The third-gen WagonR is underpinned by the latest version of Suzuki’s Heartect modular platform. The new platform not only makes it longer but significantly wider as well. And the increase in size is quite apparent at first glance. As they say, if it ain't broke, don't fix it. Likewise, Maruti Suzuki has not tampered much with the WagonR’s design. The new hatchback continues to be tallboy, which not only makes getting in and out of it easy but also gives it more headroom than one could ask for. The large windows make the cabin feel airier still. While new WagonR has carried forward the original design approach and continues to be boxy, it hardly resembles the past two generations that were on sale in India. Maruti has taken advantage of the increased width by making the WagonR’s front fascia relatively flatter. The flat rectangular grille amplifies the increased horizontal real estate. The headlamps are chunkier than before and are equipped with regular multi-reflector units like all its rivals except the Tata Tiago, which gets projector units in its top-spec variant. It’s sad to note that the new top-spec variant, the Zxi, doesn’t feature dual-barrel projector headlamps, unlike the older model’s Vxi/Stingray variant. And it seems like the WagonR is no longer Maruti Suzuki’s ‘Blue Eyed Boy’ as it has ditched the blue tinted parking lamps as well. Previous generations of the WagonR were always pretty plain-jane to look at. The third-gen model seems to be an anomaly as there are prominent creases on the wheel arches. The new hatchback even gets a subtle, yet noticeable waistline. These enhancements make it look less slab-sided than the older model and also helps jazz up the exterior of the new hatchback tremendously. Going with the latest trend, Maruti has incorporated a black plastic applique on the C-pillar to create a floating roof effect. There are trendy new colour options like Autumn Orange to choose from too! Although the new tyres, which are wider and get thicker sidewalls, look more proportionate to the body, even the top-spec variant misses out on alloy wheels, like the Santro. However, there’s a set of optional multi-spoke alloy wheels, which are priced at Rs 4,900 per unit. It is worthy to note that there’s an optional all-around body cladding on offer as well. It definitely gives the new WagonR a unique character to it. The rear profile is nearly as flat as before. However, the rear windscreen is slightly raked compared to the previous model. The licence plate continues to find a place on the boot lid, while the tail lamps seem to have been inspired by the ones seen on Volvos. Unlike the older model, the new WagonR’s rear bumper doesn’t feature a fog lamp. Like most new cars from Maruti, there are no badges at the rear. Except for the Suzuki logo, that is. Thanks to its tallboy design, one only needs to walk into the new WagonR, which is quite a boon for elderly passengers. What further aids convenience are the doors, which open at nearly ninety degrees. So getting in and out of the WagonR is a breeze, like always. The WagonR’s dashboard has been completely redesigned and features a dual-tone black and beige layout with dull silver accents. The steering wheel is a straight lift from the Ignis, but doesn’t get a leather wrap like the more premium hatchback. The centre console is dominated by a 7-inch touchscreen infotainment system, which is a first for the WagonR in India. It juts out of the console slightly and is flanked by vertically positioned centre AC vents. Below it, you find the controls for the manual AC. The seats are upholstered in a greyish-beige shade with brown highlighters. The lighter upholstery, dual-tone theme and plenty of headroom make the cabin feel lairy. The front seats are comfortable with adequate side bolsters. As we’d seen with previous-gen models, there’s an underseat storage compartment below the co-driver’s seat. The rear seat, on the other hand, lacks underthigh support even for average-sized passengers. But rear legroom is more than sufficient and is easily among the best in the segment. Thanks to the increased width, the middle rear passenger in the third-gen WagonR will feel a lot more comfortable than on the previous model. The rear floor is also nearly flat, with just a mild hump in the middle. With a boot space of 341 litres, the new WagonR is significantly more spacious than its rivals as well as several cars from higher segments. In fact, it gets a bigger boot than the Vitara Brezza (328-litre) and Baleno (339-litre). This makes the new WagonR among the few sub-4m cars that have over 340 litres of boot space. Other cars in this elite list include the Nexon (350-litre), Honda Jazz (354-litre) and WR-V (363-litre). Thanks to a wide and accommodating boot as well as 60:40 split-folding rear seats, the new WagonR is more than capable of ferrying your family and friends to the airport. It is hard to fault the WagonR’s interior, but there are some ergonomic issues that we need to point out. First off, none of the headrests in the WagonR are adjustable. Maruti could have at least provided adjustable headrests at the rear to make longer drives more comfortable. Also, the placement of the centre-right AC vent (right behind the steering wheel and left-side control stalk) not only obstructs airflow but will also freeze your fingers when the AC is at full crank. While the steering wheel can be adjusted for height, Maruti has sadly omitted height adjustment for the driver seat. It could have at least offered it on the top-spec Zxi variant. The Hyundai Santro also misses out on height adjustable driver seat, but the Tata Tiago doesn’t. As for the rear half of the cabin, the hand rest on the rear doors are downright tiny, which makes the controls for the rear power windows hard to access, especially for adults. Aside from these minors hiccups, the overall fit and finish inside the cabin feel like a step above the second-gen model. And it’s good to see that the new WagonR has retained its practical bits too. The third-gen WagonR gets a 7-inch touchscreen infotainment system that Maruti likes to call the SmartPlay Studio. It features Android Auto and Apple CarPlay and there’s even an app for your smartphone that supports various functions, including AHA radio by Harman (Aha Radio organises your favorite content from the web into a personalised, live, and on-demand radio station), MapMyIndia navigation, and more. The unit features a capacitive touchscreen (smartphone-like) and packs a simple tile-type layout. Although it is visible in direct sunlight, it causes a slight glare, which could have been avoided if the screen was tilted towards the driver like in the Swift. This new Harman-sourced unit will gradually replace the previous Bosch-sourced system in new Maruti cars. The third-gen WagonR is powered by a set of petrol engines with both manual and AMT options. While it carries forward the existing 1.0-litre, 3-cylinder engine, there’s a new, more powerful 1.2-litre, 4-cylider motor as well. We sampled it with the manual transmission. The 1.2-litre engine is same unit that powers bigger hatchbacks like the Swift and Baleno. Update: A new CNG option has been added to the Wagon R lineup. This will be available only with the 1.0-litre engine and in the base L trim. Full details are here. Compared to the 1.0-litre engine on the older model, the 1.2-litre engine gets a healthy 23Nm boost in the overall torque, while the power output has been bumped by 15PS. With the kerb weight reduced by as much as 50kg, the new WagonR powered by the 1.2-litre engine feels peppy compared to the previous model. It doesn’t require as many downshifts and picking up the pace is relatively easier. The 1.2-litre engine is capable of picking up speed from 15-20kmph in third gear without asking for a downshift. Surprisingly, the engine is noticeably audible inside the cabin, unlike its siblings share the same powertrain. This could be due to the lack of adequate insulation. New Maruti Wagon R 2019 Mileage: Does It Beat Hyundai Santro, Tata Tiago & Datsun GO? The ride quality of the third-gen WagonR has vastly improved over the second-gen model. This is down to the new stiffer chassis, wider tyres and a relatively softer suspension setup. Unlike before, bumps and undulations do not upset the tallboy much. The four-pot engine produces lesser vibrations when compared to the older model powered by the 3-cylinder engine. The steering is slightly on the heavier side at city speeds and is a bit vague as well. We would have preferred if the steering had a bit more feel to it. And while the front wheel well is partially covered, the rear doesn’t get any cladding. Hence, debris that hit the wheel well are audible inside the cabin. If these had adequate cladding, it would’ve polished off the overall ride experience even further. But these bits aren’t deal breakers given the segment the WagonR competes in. The WagonR still doesn’t like sharp turns as it simply rolls. This is partly due to its height and softer suspension setup. Like other cars in the segment, it prefers to be driven in a gentle manner. Driven in such a manner within city limits, the WagonR will impress you, especially with its new peppy 1.2-litre motor and plush ride quality. The small turning radius of the WagonR also makes zipping past traffic in the city easy and will prove to be useful while parking in tight spots. The third-gen WagonR is available in three variants: L, V and Z. While the base-spec L can only be had with the smaller 1.0-litre engine, the range-topping Z is offered with the new 1.2-litre motor. The mid-spec V variant, on the other hand, is available with both the engine options. The third-gen WagonR is available with a driver airbag, ABS with EBD, ISOFIX child seat anchors and rear parking sensors as standard. The top-spec Z variant adds co-driver airbag as well as front seatbelts with pretensioners and load limiters. These two active safety features are available as optional extras on the L and V variants. The new Maruti Suzuki WagonR has evolved in almost every aspect, be it safety, performance, features or even design. While the new design isn't striking, Maruti has made sure that it isn't boring to look at like the previous models. The design will eventually grow on you as it grew on us. With the third-gen WagonR, Maruti aims to play its practicality card once again. The carmaker has taken its game a rung higher with the new WagonR. The increased footprint has even resulted in a spacious cabin and a humongous boot. On top of this, it’s also available with a more powerful engine. That said, the new WagonR isn't perfect, especially when it comes to the rear seats. But it is better armoured than ever and is ready to challenge its rivals that have been setting new benchmarks one after the other.